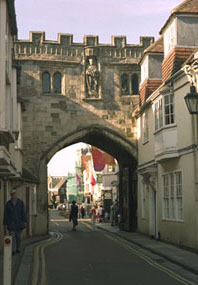 North gate between the town and the Close. The cathedral was set on spacious grounds that provided ample sites for the houses of the cathedral clergy, the bishop, the dean and the resident canons. The enclosure or Close occupied 83 acres that was bounded by the river on the west and south sides and by deep drainage ditches on the north and east sides. In the 14th century the ditches were replaced by a wall some 13 feet high with four gateways into the Close. The dean and the wealthier canons built large houses on sites of 1 1/2 acres west of the cathedral along the river. Seven and a half acres south of the cathedral were set aside for the bishop's Palace. While there are a few medieval remains still visible in the houses of the Close, most of the buildings date from more recent times.